This bright and spacious ground floor flat opens to attractive communal grounds, set within this highly-regarded housing development for the over 55's, which was built in 1987 and located in a peaceful part of town which is a 10 min walk in to the town. 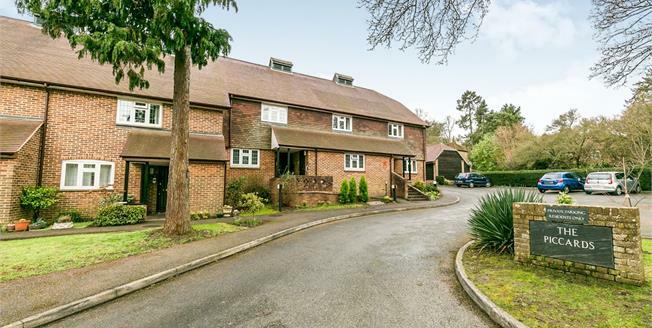 This lovely development which has parking, is made up of 22 flats, managed by the residents themselves.The flat is accessed via a covered entrance porch with a front door to the hallway with storage cupboards and doors to all rooms. The spacious living/dining room has an electric fireplace with sliding doors opening to a private paved patio area, surrounded by the communal grounds. The kitchen has a range of units, a built-in oven with gas 4-ring hob and extractor fan above, space and plumbing for all the usual appliances, tiled splash back and tiled flooring. Bedroom one is a front aspect room and there is an en-suite shower room comprising low level w.c, pedestal basin, Bedroom two is also a good sized double room, The main bathroom comprises panel-enclosed bath with shower above, low-level w.c, pedestal basin, storage cupboard. The pretty communal gardens are very well tended with most areas laid to lawn featuring a covered seating area, paved pathways and established flower and shrub beds.